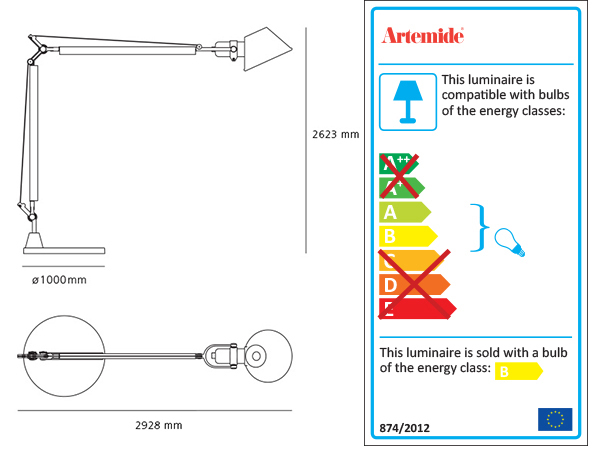 ARTEMIDE TOLOMEOXXL OUTDOOR is a floor lamp. The famous Tolomeo, icon of the Italian Design, becomes giant. In scale 4:1 relative to the table model, it’s both indoor and outdoor. Fixed support (pivot) made up of mass-coloured concrete; mobile-arm structure in extruded EN-AW-6060 aluminium with bright anodizing treatment; diffuser in mass-pigmented polypropylene, screen in light-diffusing silkscreened methacrylate, reflector in painted aluminium; polished-painted articulations in die-cast EN-AB 46100 aluminium; adjustment system in AISI 316 stainless steel; silicone seal gaskets.